With our in-depth knowledge of this domain, we are actively engaged in manufacturing a supreme quality range of Mounting Set. We design and manufacture Engine Mountings for 3 wheeler . These Engine Mountings for 3 wheeler are highly durable and heat resistant and are carefully engineered so as to prevent engine from shock excitation. These Engine Mountings for 3 wheeler also support in isolating engine vibrations caused by the starting engine. With our rich industry experience, we are able to offer our esteemed clients a wide assortment of optimum quality of Engine Mountings. We offer top quality engine mounts & cabins mounts to our valuable clients. These mountings are manufactured using good quality metal components, bolts, nuts, casting ferrous and non- ferrous procured from trusted vendors. Suitable for high vertical static and shock load in compression, these mounting provide high isolation value in the horizontal shear direction. 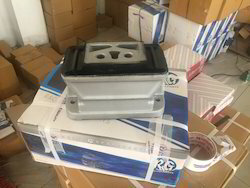 Bell crank, steering arm, engine mounting for heavy duty vehicle. 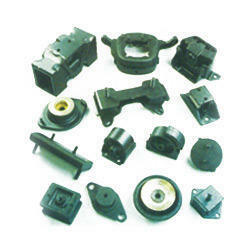 We offer a wide array of rubber mounts, fabricated from best grade raw material. Our range of rubber mounts meets the highest standards of quality which provides them superior performance for a longer period of time.